Specializing in quality FX Luminaire brand landscape lighting. Landscape lighting brings outdoor spaces to life after the sun goes down, providing an unmatched aesthetic effect while adding safety and usability. The trained lighting experts at River Ridge Landscape Co can develop a plan for professional landscape lighting that makes your home the envy of the neighborhood. Highlight focal points. Accent architectural features and textures. Create visual depth and a resort-like feel. 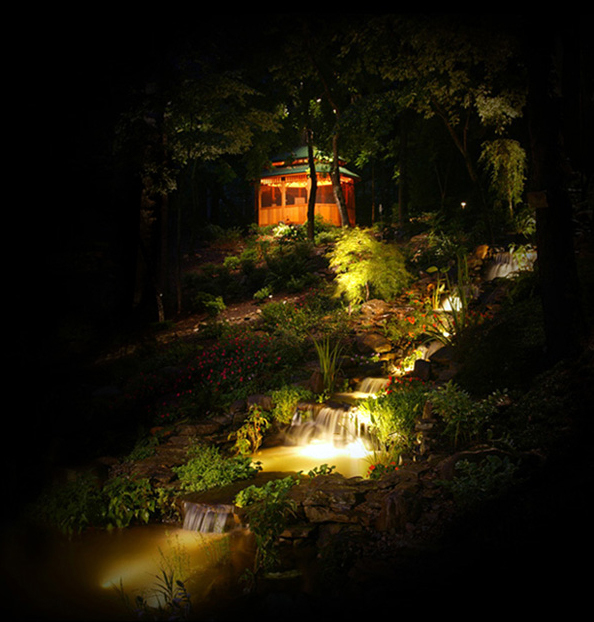 Landscape lighting enjoyably extends the time spent outdoors. Patios, pools and children’s play areas become entertainment venues or relaxing places to unwind. Hazards such as steps or vegetation can all be avoided with properly placed landscape lighting. Guests can be safely guided away from hazards.